Later that afternoon i met some fellow scritti aficionados, Mike, Steve and Justin. We had a couple of drinks up the road and short after seven walked up to the Scala. There were already some familiar faces, and in the corner there was a small merchandising stand, where you could buy t-shirts and badges and a flyer for free. I felt a bit like a freeloader when i grabbed four of each, but i gotta fullfill my duty towards the bibbly-o-tek team of course! The Scala is a rather nice roomy place with lots of stairs, the hall itself surrounded by balconies and some elevations at the back, providing everyone a decent view on the band. When we first got there was already a band playing, and just now i realise i don’t know the name of it! Shame on me. I couldn’t get into it – we went back to the foyer and had some more drinks and talked a bit more. Even when Wet Dog started playing, whom i liked when i saw them in the Luminaire, couldn’t distract me. The hall was now nicely filled. It’s hard to guess how many people there were, the website says the capacity is 1,145, so maybe there were like 700-900 people or so? By now we were all staring at the small door besides the stage which was slightly open, through which we could see the band starting to get ready to go on stage. When they finally got there, a loud cheer rised up and all was set to go! My first surprise was not that the first song was The Boom Boom Bap, but that it was played not with a tape, but live. This was so much better than the previous gigs! Green in his Vivien Westwood suit looked the part, Alyssa wore a beautiful dress, Rhodri had a snappy blue tie, Ralph looked his usual fierce, switching between a normal drumset and a digital one, Dicky and Dave as always casual. The setlist was about the same as the ones in Brighton and Oxford, no real surprises there. The band sounds together, the rehearsals have certainly payed of. Next time i go see a gig, i do wanna simply enjoy it, this time i knew i wanted to capture some songs, and that is a bit distracting. Still, i managed to switch between watching the stage and watching the camera – hence the swaying! My favourite songs were The ‘Sweetest’ Girl and Skank Bloc Bologna, but frankly, i just liked it all. I’m trying to remember now if there were two or three encore’s, Woodbeez was one, E11th Nuts was one, was there another one before that? Then it was over. *sigh* Still, there was an afterparty in the Glass Bar upstairs going on. I didn’t really need the access all areas thing, i was given it much later, but it’s a nice memento. We mingled a bit, and at the end i ended up sitting on the stage watching Andy packing up all the equipment. That was a lot of work! Which reminds me: i promised him to say that both Green and Andy think Brook Guitars in Devon make the best acoustic guitars in the world! This sponsored link is payed for by the generous offering of a Tesco’s Finest chicken and avocado sandwich from the dressing room to a silly me who hadn’t eaten anything since lunch. I’d just like to stress that it sounded a whole heap better than these clips might suggest! If I was picking what I would like to see/ hear it would be the same as your selection. Am I Right In Thinking is one of my favourites, I feel sick and wrong for knowing it so well! I’m sure Rhodri’s right… but for me the charm and the interest of an ad hoc recording is precisely that it isn’t either a carbon copy of the studio album, or a carefully remixed and sanitised ‘BBC’ reconstruction. It’s good that a website is a little ragged round the edges, and the exuberence of the playing is what counts. Having said that (and as a film professional) it’s clear to me that the original sound must have been pretty good (witness the clear trebles) especially as the majority of gig spaces tend to muddy up the sound – to say nothing of the padding effect of hundreds of sweaty bodies which similarly deadens the overall sound. The overall effect is to make me really determined to get to a SWcrits (or GG&TT3) gig as soon as I can. Thanks Ellen, and thanks Rhodri. I know Rhodri, it sounded heaps better! I hoped standing in the back would make it sound better than earlier clips i made, to no avail. It’s just a tiny still camera. Thank you so much for the clips, Ellen! I have an awful feeling that we might not see Green and the revitalized Scritti here in the US, but at least I can say I’ve seen your clips of “Wood Beez” and “Sweetest Girl,” which is more than I’d ever hoped for. Here Here! Many many MANY thanks for all of those clips, Ellen–truly a generous sacrifice in order to get some of the finer points of a Scritti concert for posterity. Sandy, I somehow get the feeling that you’re right about no Scritti tour in the US (there seem to be a lot of factors against it–er, historically speaking, that is), but I dare not consciously admit it for fear that it will somehow affect the outcome. Nonetheless, just getting to see and hear those few minutes’ worth was by far the high point of an otherwise low week. I take back my previous comment about the first incarnation of Scritti being the most interesting–those clips are mesmerizing. ellen, i had a goal to video the same songs as you, plus mrs hughes, and i too only got a minute or so of wood beez. i’m sending the clips to john hyde so you may well end up with them here on bibbly-o-tek. your pictures are slightly better (i was near the back with my pregnant wife! ), my sound is slightly better. friends at tate britain and tate modern they tell there may be a free scritti gig, probably at tate britain, next month, but it’s not confirmed. i’m sure we’ll hear officially soon. 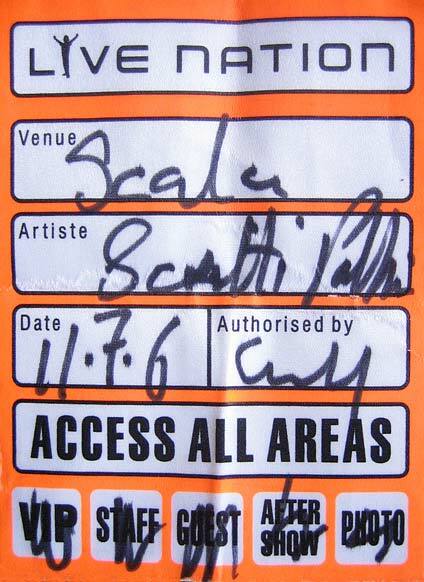 Thanks so much for the clips of Scala….being a fan since 85 and walking in the cloud that was Scritti Politti and finally seeing a clearing in the year 2006 has been a dream come true. Hope they come to Florida and see me at the space center. I was at the Scala, too … and like everyone else who’s posted, was blown away by the experience of seeing the band live after all these years. Just in case anyone missed it, there was an enthusiastic four-star Scritti review in the Guardian this morning that captures the excitement of the gig really well.